When a Fusion Monster(s) is Fusion Summoned to your field (except during the Damage Step): You can target 1 of those monsters, apply these effects in sequence. ● Special Summon 1 “Lunalight Token” (Beast-Warrior/DARK/Level 4/ATK 2000/DEF 2000) to your opponent's field. ● That target gains 500 ATK for each monster your opponent controls (even if this card leaves the field). 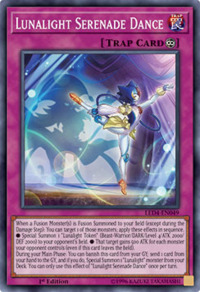 The monster that appears in this card's artwork is Lunalight Blue Cat while the shadow behind her is Lunalight Cat Dancer, implying that the former is the younger version of the latter (despite Cat Dancer having very lenient Fusion Material requirements and not specifically needing Blue Cat as one of them). This card's name is a reference to Celina's name (Serena) in the Japanese version. Along with this card's artwork, it could also possibly refers to the relationship between Celina and Ray Akaba, her older alter ego/predecessor.